The lineup on the main stage Saturday night traced the arc of ongoing changes in folk music at a time when the old guard is giving way to a new generation. Tom Rush took the stage at around 10 o'clock. He didn't present a greatest hits set, as I have seen many aging folkies do, though he did perform a quietly compelling version of the FM radio classic, Drift Away, which was a hit for Dobie Gray and just about everyone else for the next thirty years. Rush made the song swing with quiet harmonics and gentle plucking. I never fully appreciated what a terrific player he is, even though he pioneered the use of alternate tunings in the 1960s, perhaps because he never drew attention to his technique. It takes a special kind of artistry to make a song more compelling by turning down the volume. 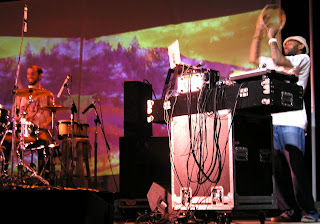 The drum and turntable duo Fraction Theory followed, opening their set with a sample from Tom Rush's signature song, No Regrets: "no tears, goodbye." They sampled Johnny Cash and Joni Mitchell, not to render them obsolete, but to place them in a contemporary context. 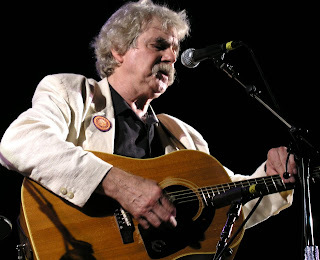 Their music is not so much a goodbye to folkies like Tom Rush, but an introduction to the iPod generation. Iron and Wine finished the evening with a solo performance that commanded the audience's attention all the way to the top of the hill. 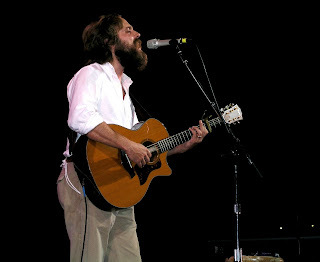 Iron and Wine (Samuel Beam offstage) was born in 1974, half a lifetime ago for Tom Rush. He played with vigor and sang with a warm and friendly voice. The last solo artist I saw hold the crowd's attention at this hour on a Saturday night was Bruce Cockburn in 2002, and this was after 25 years of recording and touring. That Iron and Wine could do it after just seven years of performing bodes well for the future of folk music. The Philly Folk Fest did well in programming younger musicians that connected with younger folk fans. Folk music enthusiasts should have no regrets that younger artists are stepping up to the microphone.